Let’s Talk About Love is the latest addition to the Swoon Reads line! I’m a huge fan of this line so I was excited to read this novel, especially with all the great things I’ve been hearing about it. One of the highlights of Let’s Talk About Love is the representation! First, Alice is a biromantic ace and a black woman! The love interest is a Japanese man. The whole cast of minor characters is filled with POC and LGBTQ+. While I am not a POC or part of the LGBTQ+ community, this representation matters and I am so happy that others are finding mirrors within this novel. Also, I love how much issues are addressed within the novel! Alice is such a cute main character! I adored her Cute Codie, Alice’s way to classify her reactions to aesthetics and cuteness. Alice lives with her best friends and together they really do take on the meaning of creating your own family. Her best friends are fleshed out characters and it was great seeing them as such an important part of her life. One part I struggled with was the writing style. It’s written in third person past POV, which I am not a fan of for contemporary reads. I’ve just always had a difficult time getting into this POV. Another part that was hard to get behind was Takumi, the love interest. There were parts about that I liked, but there were also parts that got on my nerves. Overall, Let’s Talk About Love is full of important representation and many people will enjoy it! Claire Kann hails from the glorious Bay Area where the weather is regrettably not nearly as temperate as it used to be. She has a BA in English/Creative Writing from Sonoma State University, works for a nonprofit that you may have heard of where she daydreams like she’s paid to do it. 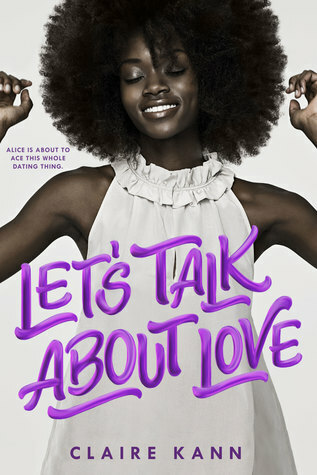 LET’S TALK ABOUT LOVE is her debut novel. Yay!! Good luck! I hope you love it when you get the chance to read it! I can’t wait to read this book. The cover is super fun and cute too! YES! I love the cover!! So fun! This is on my list. Can’t wait to read it and I super love the cover. Yay! I hope you enjoy it! I love the cover so much, too! I have this but I’ve heard similar thoughts about the love interest and it’s making me wary. I might give it a go next week so I can see for myself. You should definitely give it a try! Others have loved it and it includes a lot of important diversity rep! That’s interesting that you prefer a certain voice for the contemporary genre. But I suppose that makes sense! I often don’t like 1st person present-tense, but when it’s contemporary I usually have an easier time being okay with it. Yeah! I usually like third person for fantasy books as that allows for more descriptive writing and world building. Great review! I agree, I’m so happy we’re seeing more diverse rep in YA novels – it’s much needed! Thanks, Kavita! Diversity really is necessary and I’m glad more stories are starting to be published, but there needs to be much more!